Like many, I spent a fair amount of time playing video games in my youth, mainly on my trusty ZX Spectrum (showing my age now) before moving on to the Megadrive and Playstation (no numbers on my Playstation!). As I got older, though, other things began to fill my time, and gaming moved on and left me behind. Even the Nintendo Wii we bought a few years ago has been used for little other than weighing in on Wii Fit. That said, I don’t think I’ve ever lost my enthusiasm for gaming, and so I was thrilled when Nintendo got in touch and asked me to review LEGO City Undercover, a title exclusive to their latest console, the Wii U.
LEGO City Undercover is an open-world adventure, which sees you take the role of Chase McCain, a maverick cop returning to LEGO City to clean up a crime wave being orchestrated by Rex Fury, a criminal who Chase put behind bars several years ago. Rex recently escaped from prison, and not trusting the local police to put him to justice, the mayor has brought Chase back to do the job. Throw in a love interest (Natalya, a paramedic who is part of a witness protection programme after Chase inadvertently identified her as a witness in the original Rex case) and the stage is set for some adventure. If the plot sounds cheesy and cliche-ridden, well, I suspect it’s supposed to be, because that’s a large part of the fun. Chase himself is part Bruce Willis and part Clint Eastwood, and the game is full of Hollywood references, most of which will sail far over the head of a large number of (younger) players. My favourite (so far) is the mission in Albatross Prison which is chockful of references to the Shawshank Redemption. The game itself involves running, driving, swimming and climbing around LEGO City, following clues and instructions from Police HQ, with the ultimate goal of capturing Rex Fury. Along the way there are various puzzles to solve and objects to find, as well as LEGO structures to build, and I’ve had a lot of fun doing all of those. One of the best things about the game is the use of the Wii U Gamepad. A traditional controller combined with a 6 inch touchscreen, the Gamepad is the Wii U’s big selling point, and it’s been very well incorporated into LEGO City Undercover. As well as being used to control Chase’s on-screen movements, it’s a real world representation of Chase’s communicator. This piece of in-game kit combines mapping, video calling and a scanner which can be used to find hidden objects and clues, and using it in the real-world really brings the game to life, making it feel like you really ARE Chase McCain. I obviously loved the game, but what did the kids think? Heather’s never really “got” video games in the past (her idea of playing Mario Kart was to reverse around the track and crash into things, because it made me laugh, rather than actually racing) so I wasn’t sure what to expect. But she loved watching while I was playing, and was keen to have a shot of her own. Initially she preferred crashing and driving into the river to following the path the game wanted her to, because it was funny (sound familiar?) but after I got her to the police station and she got to explore and solve some puzzles for herself she really enjoyed herself. I did have to sit with her while she was playing, because although there is plenty of on-screen help and instruction, Heather can’t read yet and needed someone to help her along. Not a real problem, and it meant it was something we could enjoy together. So there you go, an excellent game with something for all the family. My only complaint would be the long time to load each level, although I gather that’s a Wii U issue, rather than one specific to this game. It did mean, though, that we got to hear the load music (think 70s cop show theme, heavy on the wah-wah guitars) which both Heather and Megan had fun singing and dancing to. 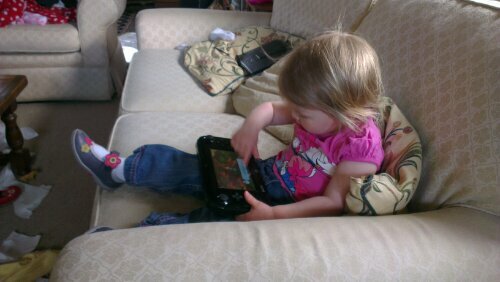 Speaking of Megan, at 2 she’s a bit young for a game as complex as LEGO City Undercover, but as this picture shows she did have fun playing with Nintendoland! Nintendo provided me with a Wii U console and a copy of LEGO CIty Undercover for the purposes of this review. All words and opinions are my own, and links have been included out of courtesy. 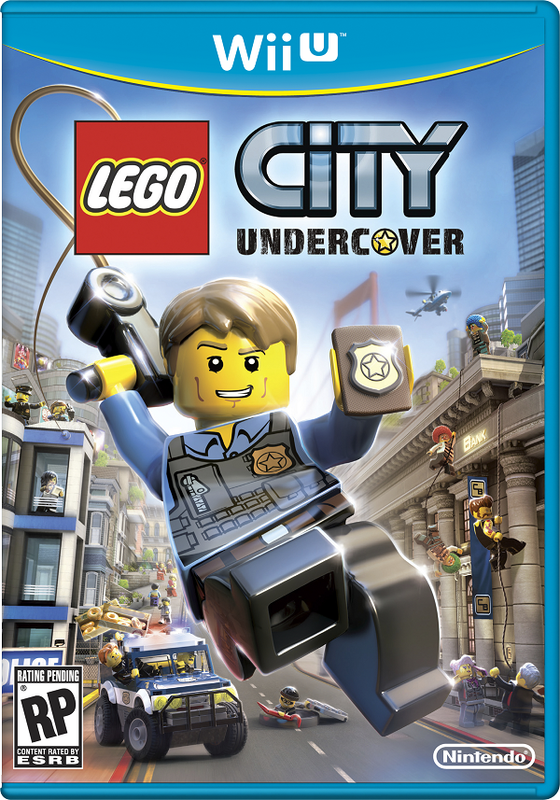 This entry was posted in Gadgets, Uncategorized and tagged lego city undercover, nintendoland, review, wii u by richy. Bookmark the permalink.